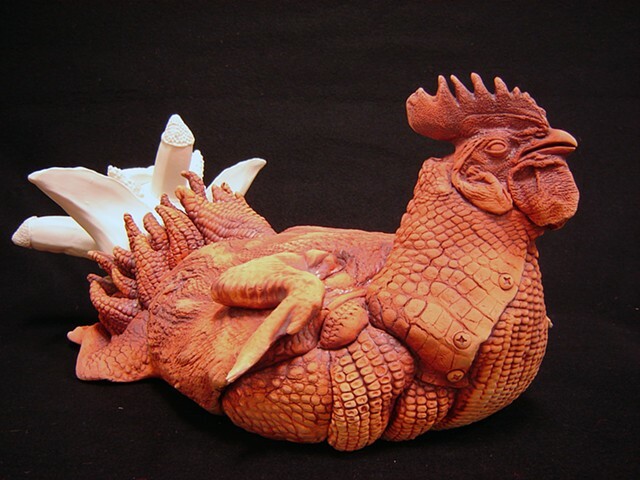 David Scott Smith Ceramics - Reject GMO "Franken Chicken"
The Reject GMOs are my version of GMO organisms engineered and grown in the laboratory, in the fervent corporate quest to produce new and exciting foods and products -- but unfortunately these organisms were discarded, because for one reason or another they were not commercially viable. Perhaps some were too aggressive (excessive biting and viciousness, for example); in any case they are one-of-a-kind genetic combinations of animal and plant, and in some cases even human (a human will eat anything  they are easy to feed). This Chicken has been engineered with fruit and corn, and her backside glows every time she lays an egg.